Railpictures.ca - A.W.Mooney Photo: In what would be considered standard fare for back in the day, a westbound GP38-2 leads a couple of GP40-2s off the Oakville Sub and onto the Dundas, as seen from the hillside at the Royal Botanical Gardens before all the foliage wiped out this as a shooting location. 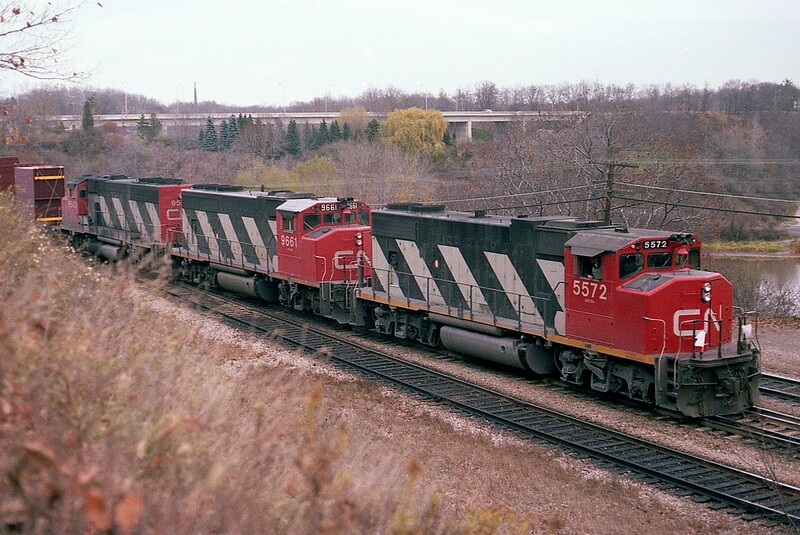 Units are CN 5572, 9661 and 9543. I also noted the car count, which was 47, and the caboose, #79411. | Railpictures.ca – Canadian Railway Photography – photographie ferroviaire Canadienne. Caption: In what would be considered standard fare for back in the day, a westbound GP38-2 leads a couple of GP40-2s off the Oakville Sub and onto the Dundas, as seen from the hillside at the Royal Botanical Gardens before all the foliage wiped out this as a shooting location. Units are CN 5572, 9661 and 9543. I also noted the car count, which was 47, and the caboose, #79411. Interesting placement of the white flags.